Interesting Fact: When CPP started in 1966, the contribution rate was only 1.8% (each) and held at that rate for 30 years. It was expected CPP would provide you with an income equal to 25% of your Pensionable Earnings. Starting in 2019, the contribution rate will be 5.10% (each) and will gradually increase to 5.95%. Benefits will also gradually increase and will be fully implemented within the next 40 years, providing you with an income equal to 33% of your Pensionable Earnings. Once you reach the maximum contribution amount (ie. $2,748.90 for 2019), you will stop payments to CPP and will be on a ‘contribution holiday’ until January 1 of the next year. Typically, those earning more than $53,900 in 2019 will experience a contribution holiday at some point in the calendar year. The more you earn, the faster you reach the maximum contribution, the faster you are on a ‘contribution holiday’. While a ‘contribution holiday’ sounds great, many people get “used to” the higher income and then find it difficult to adjust to lower pay starting January 1 of the next year. SOLUTION: once you reach your maximum CPP contribution, have payroll redirect the amount normally going towards CPP into an Employer Sponsored RRSP or Pension Plan. This allows you to maintain a consistent income and helps to increase your Retirement Savings, painlessly. Note: This solution can only be offered through an Employer Sponsored RRSP or Pension Plan. Don’t have a plan at work? We can help. For more information on how to set up this convenient way to budget and save, please contact us at The Winch Group. We look forward to connecting with you. What does this mean to Employers currently offering the “CSB – Payroll Savings Program” to their Employees? What does this mean to Employees who are using this to help them save? First and foremost, any un-matured CSBs are safe and guaranteed and the bonds will continue to be honoured until the time of redemption or maturity, whichever comes first. Why is the government stopping this program? Quite simply, those looking to save have found better alternatives and the Government of Canada has found better ways to source funding. Most Employees were using payroll CSB as a way to ensure savings (ie. the money is taken out before their income is paid to them). The convenience of payroll deduction is important for many. Most Employees are using the company RRSP/Pension Program to save for retirement. They were using CSB for short to mid-term savings with many having a specific goal (ie. vacation, reno, car etc.). To help Employees maintain a convenient payroll program, we are suggesting looking at using a TFSA as the alternative. If you, or your company does not have a TFSA as part of your retirement program, please contact our office and we will review if this product is right for you. 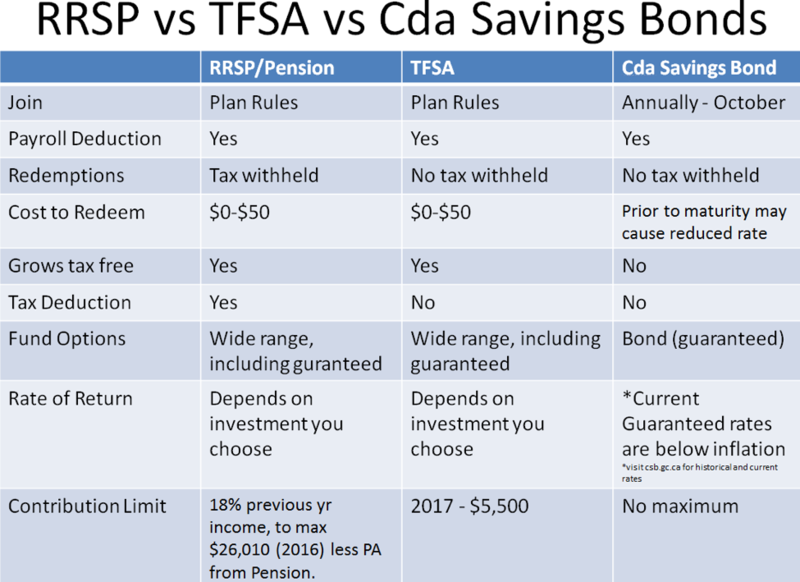 Here is a quick glance summary chart of the similarities and differences between RRSP/Pension vs TFSA vs Canada Savings Bonds (see chart to the right). Employees can benefit from using a TFSA instead of the current Canada Savings Bonds. We encourage our Plan Sponsors to communicate the ending of the CSB and to consider alternatives. Please reach out to your Advisor for assistance. 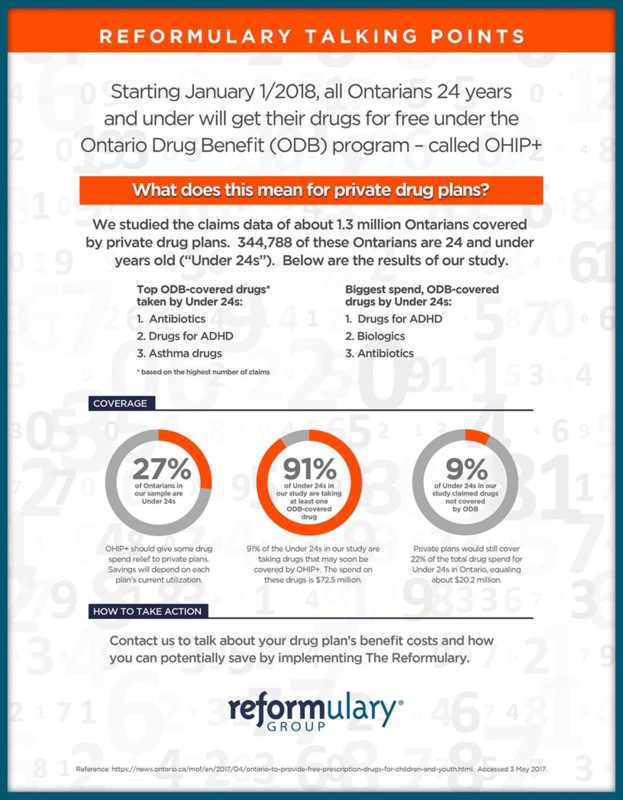 On Thursday, May 4, the Ontario Government announced the introduction of OHIP+, or Pharmacare, covering all Ontarians 24 years of age and under. Our associates at the Reformulary Group mined their data assets and studied the potential impact (benefit) to private drug plans. The chart on the right is the analysis (click to enlarge). As you would know, the benefit will be different for each client based on the number of claimants in Ontario, utilization, etc. Don’t Tax My Health Benefits! The Winch Group Inc. is one of the founding firms of The Benefits Alliance Group, which is a comprised of 34 professional independent benefit consulting firms with over 150 advisors. Together, we manage approximately $700 million of group insurance premium and over $3 billion in retirement plan assets on behalf of more than 7,000 employers across North America. Our commitment to being an Industry Advocate and Thought Leader is our foundational purpose and represents the interest of our members and their respective clients. Our Benefits Alliance Members are actively involved in various insurance and health organizations to help get our voice heard on issues of great importance to our clients. A critical issue that must be addressed is the federal government’s plans to consider a new tax on employer-paid group health and dental benefit plans. We are working with carriers to align ourselves in their fight against the proposed tax that could be seen as early as the federal budget in the spring of 2017. Twenty million Canadians rely on group health benefits and this tax could drastically affect their coverage. Their plans could be cancelled or scaled back, putting more pressure on already stressed public healthcare systems. If taxable, employers may no longer be able to make participation mandatory. Health Care spending accounts could become irrelevant if they are taxable. This proposed tax will place a greater burden on millions of middle and low income Canadians which misaligns with stated objectives of the new Government’s goals to help middle and working class families. Currently, tax-free employee benefit programs are viewed as an important part of an employee’s total compensation package and this new tax could make it more difficult to attract and retain new human resource talent. Please show your support in stopping this new proposed taxation. Recent studies from Aon Hewitt and Mercer Canada are estimating average salary increases across Canada to be in the range of 2.6 – 2.8% for 2017. This is fairly consistent to what we’ve seen over the past few years. Not surprisingly, Alberta and the oil and gas industry in particular are anticipating much lower than average increases, along with organizations in the banking, transportation and media sectors to name a few. Industries such as automotive, consumer products and life sciences are expecting to see higher than average increases, according to the studies. Employers are encouraged to account for these salary/wage increases in their 2017 budgets. NCHR has received a number of calls recently from clients inquiring about their options for employees who are on leave from work, including potentially terminating an employee who is on Parental leave. Depending on the situation, altering terms of employment and/or terminating an employee while they are on leave generally creates significant risk to the organization, particularly if they are on approved sick leave and/or Pregnancy/Parental leave, for instance. Even when the changes or termination are deemed necessary for reasons completely unrelated to the leave from work (ie. when a job is eliminated or becomes redundant, for instance), it could still be considered in violation of legislation. Simply put, altering terms of employment or terminating an employee while they are on approved leave from work is not recommended unless absolutely necessary. If your organization is facing a challenge like this, please give us a call to explore your options before you act. Please note the number of weeks of paid benefit is NOT changing. Currently the payment period is 17 weeks, including a 2-week waiting period (no paid benefit is issued) and 15 weeks of paid benefit. With the proposed changes the payment period consists of a 1 week waiting period (no paid benefit is issued), 15 weeks of paid benefit and 1 week with no benefit. Plans registered with the Employment Insurance (EI) Premium Reduction Program will have to reduce the waiting period for Weekly Indemnity (WI) and/or Short-Term Disability (STD) benefits from two weeks to one week in order to preserve any EI premium reduction they are receiving. Plans that integrate the expiry of EI benefits or EI-equivalent short-term disability benefits (WI or STD) with a privately-sponsored long-term disability (LTD) benefit will be affected. We will continue to monitor and assess the impacts of these changes and communicate again as soon as we have more information. Service Canada advised the Canadian Life and Health Insurance Association (CLHIA) that employers impacted by these changes will be provided with a transition period to allow time to make the necessary amendments to their plans. During the transition period plans will continue to qualify for the EI Premium Reduction Program. If you have any questions about this EI change, please contact your Winch Group account manager. On July 15, 2016, nine provinces have signed an agreement to increase to CPP. ORPP will NOT be introduced. Increased contributions and increased benefits. Current CPP is meant to replace 25% of earnings (to a maximum). Employees close to retirement now will not see much (if any) increased benefit. 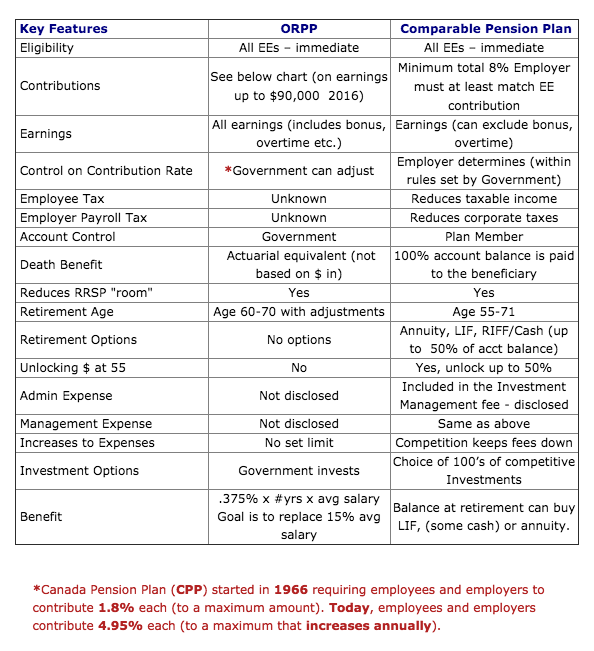 The first employees to receive the full enhanced CPP are those who retire in 2065 or later. Those in between will see an increase, but to a lesser degree (depends how long they will be contributing at the new rates). Whether your employees are just starting out or have been with you for years, employees will still need to save outside of the government programs. By providing them with a properly designed retirement program at work, they will enjoy the many benefits of a company program and will have the opportunity to retire comfortably. We are happy to provide more details about these changes and/or to discuss the merits of a properly designed company retirement program. On June 20, 2016, eight provinces have “agreed-in-principle” on an increase to CPP. Ontario Finance Minister, Charles Sousa, indicated if CPP will increase, ORPP will NOT be introduced. Employees pay 4.9% matched by employers at 4.9%. Maximum salary (indexed annually) is currently $54,900. Benefit – receive approx. 25% of your average salary over the 40 years of working. In 2016, assuming you always earned the maximum salary, you would receive $13,110 per year at retirement. Starting in 2019 small contribution increases will start and continue until 2025 for a total increase of approximately 1%, thus seeing 5.95% each employee and employer. This increase of 1% will be tax deductible for employees. Maximum salary will increase to $82,700 by 2025. The amount between the current cap and the proposed cap will only be charged at 4%, (not 4.95, not 5.95). Benefit – receive approx. 33% of your average salary over the 40 years of working. Maximum payout at retirement for someone contributing maximum CPP for 40 years would be $19,900 per year at retirement (in 2016 dollars). Not determined how this larger income will affect Old Age Security and Guaranteed Income Supplement. Government programs (enhanced CPP, OAS, GIS) will not provide your employees with enough to comfortably retire. Employees still look to their employer to provide a savings program to help them save for retirement. What does the upcoming legislation mean for employers? To avoid joining ORPP, you will need to have a “Comparable Pension Plan” in place before your company is required to join. We can help you design a Comparable Pension Plan and will provide advice on ways to minimize the associated costs. Planning a strategy in 2016 will allow both employees and employers the time to make adjustments. At your convenience, please email/call us to start your plan. * Source: Mark Sharrett, Director of Strategic Stakeholder Relations at the Ontario Pension Plan Implementation Secretarial of the Ministry of Finance. Mr. Sharrett was a guest speaker at our recent Benefits Alliance conference. What is a Comparable Registered Pension Plan? While implementation of ORPP or “Comparable” RPP may seem far off, we recommend you develop a plan and communicate it to your staff this year. In most cases, employees will be required to contribute extra money, thus will need time to budget. Offering a phased-in approach can help staff adjust each year. Our Employers/Plan Sponsors may need to consider ways to adjust overall compensation to help keep costs level. We can help you find ways within the guidelines to reduce costs, avoid costs and promote that you are an employer of choice who has a plan to avoid ORPP. Employers should encourage employees to utilize all paid vacation time in the current vacation year in order to avoid unnecessary expenses and potential liabilities. Unused paid vacation routinely becomes a liability for organizations when employees (most commonly, former employees) complain to the Ministry of Labour about not being appropriately compensated for unused vacation. The Ministry of Labour has the authority to ensure employees receive their outstanding vacation pay, and can issue penalties or fines upon organizations for violations of the Employment Standards Act, Ontario. More simply put, ‘use it or lose it’ is not a lawful vacation policy in Ontario. In order to reduce these risks, managers should clearly document when employees go on vacation, and must encourage employees to utilize their earned vacation time every year. The benefits of time away from work should not be underestimated either. If employees aren’t using their vacation, a policy that permits limited vacation carry-over on an exception basis should be considered. These policies need to be implemented and monitored in order to help reduce potential organizational risks. As most of our clients currently utilize the calendar year for vacation purposes, now is the time to review outstanding employee vacation balances and encourage employees to use their vacation time before the end of 2015. The Ontario Retirement Pension Plan (ORPP) is the new mandatory pension plan program proposed by the government of Ontario with an effective date of January 1, 2017. The ORPP is meant to offer employees, without a comparable workplace pension plan, a steady stream of lifelong income in retirement. The Winch Group is closely following all ORPP updates and will continue to monitor the details as they become available. Contact us if you have any questions. In an article recently published in Benefits Canada by Craig Sebastiano, he provided a clear overview about the ORPP we’d like to share. Defined Contribution (DC) plans will be considered comparable if they are locked in, be regulated by existing provincial pension standards, and meet a minimum contribution threshold (an annual contribution rate of 8% and require at least 50% matching of the minimum rate from employers). For Waves 1 to 3, employer and employee contribution amounts will be phased in starting at 0.8% each in the first year, 1.6% each in the second year, and 1.9% each in the third year. For Wave 4, employer and employee contribution amounts will be 1.9% each. The ORPP Administration Corporation will contact all Ontario employers in early 2016 to verify their existing plans. Employers with a registered workplace pension plan that exists on August 11, 2015, or that’s begun the process of registering one, will be assigned to Wave 4. “If the plan meets comparability thresholds by the time Wave 4 begins, the employer will not be required to enroll in the ORPP,” the government says. Any employer that doesn’t have a workplace plan but sets up a comparable plan prior to its entrance wave will not be required to enroll in the ORPP. In summary, it appears that if you don’t have a pension plan in place now or are not currently setting one up, any new plan set-up must have a minimum matching 4%-4% contribution moving forward. If you do currently have a pension plan in place and have 2%-2% matching, you will have until January 1, 2020 to move it to a minimum 4%-4% matching plan. We are still waiting for clarification on the following: If you have an Registered Retirement Savings Plan (RRSP) currently in place, do you have until 2020 to switch to DC plan, or are you held to the dates in Wave 1,2 or 3? We will continue to monitor the information as it rolls in. When you are ready to discuss your company’s best options for a pension plan, please don’t hesitate to contact us at The Winch Group. 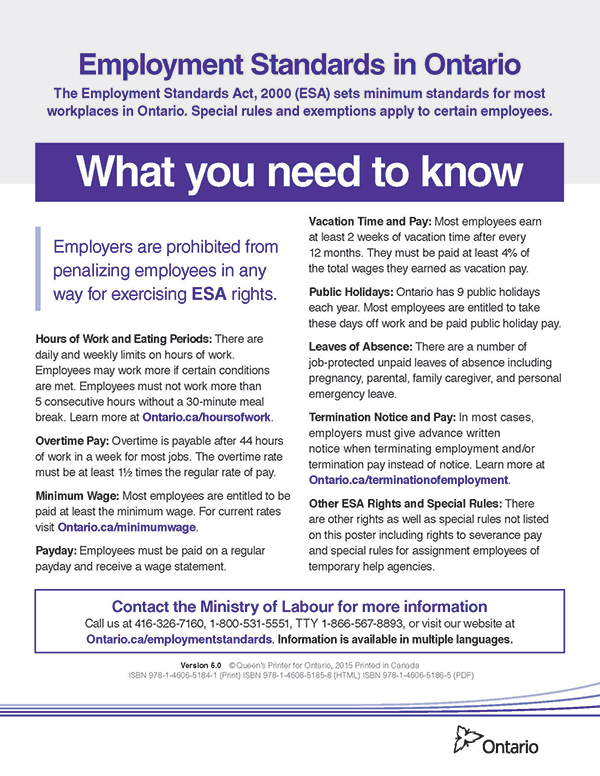 Effective May 20, 2015, most employers must provide all employees with a copy of the poster, “What you need to know about the Ontario Employment Standards Act.” You are required to provide a hard copy or an email (with attachment) of the poster to all existing employees by June 19, 2015. Additionally, all new employees must be provided with a copy of this poster within 30 days of hire. We strongly suggest making this poster part of your new employee orientation program. This poster has been recently updated to version 6.0. Please replace the old version that should be already posted in your workplace–and where all employees can reasonably see it–with this new version. Click for PDF download of the poster. 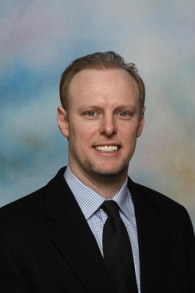 Neil Curtis was recently interviewed by the Small Biz Advisor, a Rogers Digital Media Publication, this time on the topic of Employee Wellness programs. Click here to review the article and learn some great tips about the importance of ensuring wellness programs are customized to the needs of your organization. Since our inception in late 2013, our client base has grown significantly and we have aligned ourselves with great industry partners. Recent client projects cross numerous HR functional areas, and our clients continue to refer our services to others based on our ability to deliver high quality, timely results that matter to small business. During this year’s Federal budget announcement, the current Tax-Free Savings Account contribution was increased. Under proposed legislation, the annual TFSA dollar limit for 2015 is increasing from $5,500 to $10,000. The new limit will also no longer be subject to increases based on inflation. The $10,000 annual limit is proposed to be effective immediately for the 2015 taxation year. The proposed measure increasing this limit is subject to parliamentary approval. Consistent with its standard practice, the CRA is administering this measure on the basis of the Budget announcement. Financial institutions may immediately allow existing and new account holders to contribute up to the proposed maximum. For more information, click here. Also from the budget, Registered Retirement Income Fund minimum formula rates are being reduced for ages 71 and older. Pre-age 71 RRIF rates remain unchanged. Excess RRIF withdrawals taken in 2015 (but calculated using the old rates) can be re-contributed to a RRIF by February 29, 2016. The age 71 rate is almost 30% lower that its pre-2015 counterpart, but the difference shrinks as you get older, with the rate for those age 95 and older topping out at 20% – the same rate under the old rules for those age 94 and older. The Respect Group, co-founded by 2014 Recipient of the Order of Canada and former NHL player Sheldon Kennedy, has created an online Respect in the Workplace training program for organizations of all sizes. This program has been designed to combat bullying, abuse, harassment, discrimination and incivility in the workplace. Sheldon has become an inspiration to millions of abuse survivors around the world and a committed, outspoken child advocate. This very cost effective, online workplace training program is a fantastic compliment to mandatory violence and harassment policies and practices that are required in your workplace, further helping reduce your organizational risks in these areas. For more information about mandatory violence and harassment policies and practices, contact us at NCHR. For more information about the online Respect in the Workplace training program, please contact Kevin McLaughlin at Respect Group. NCHR’s flexible recruitment program has proven time and again to save clients an average of 65-70% of the cost of a typical recruitment/search firm. We save you time and money, and help you make better hiring decisions by leveraging our vast experience and successes. This leaves you to focus your energy on your core business. Contact us for more information. After an extremely successful 2014, NCHR is very proud to announce a major partnership. Anna Ali from the Experts Group has joined the NCHR family as an Associate Partner, and we are very excited to have her on board. Anna has a wealth of successful experience in HR Consulting to go along with her Masters Degree in HR. Please visit Anna’s BIO on our website by clicking HERE. Welcome, Anna! On Wednesday, January 7, 2015, the Winch Group was pleased to appoint our latest Account Manager, Courtney Smith. Courtney joins the team and represents clients previously held under Janet Lucas. Courtney has over seven years of experience in the benefits industry. In addition to her degree from McMaster University, she is currently working on acquiring her Group Benefits Associate (GBA) designation. 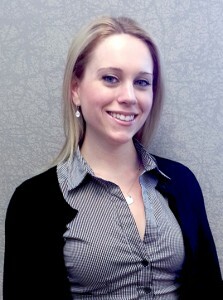 Courtney enjoys regular interaction with clients and works diligently to answer any questions they may have. She also supports a variety of local charities and actively participates in fundraising events. Feel free to contact and welcome Courtney to the Winch Group at your earliest convenience. On December 8, 2014, the Ontario government introduced Bill 56, or the Ontario Retirement Pension Plan Act, a 2014 legislation intended to provide a predictable source of retirement income for those most at risk of under-saving. Further details about the Ontario Retirement Pension Plan (ORPP) will be released in the next few weeks, followed by formal public consultation. The target launch date for the ORPP is set for January 2017. Mandatory for 3 million Ontarians without company pensions. Contributions to begin in 2017, with larger employers going first before smaller companies. Modelled after CPP with a survivor benefit – however, not transportable and no opt out. Workers and employers each contribute 1.9 % of earnings, up to a maximum annual income of $90,000. If successful, the plan aims to cover 15% of income. Fund would collect $3.5 billion a year and reserved in global investments. 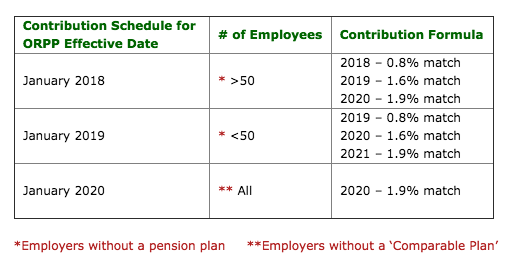 The individual does not participate in a comparable workplace pension plan as determined under the legislation (note: the bill doesn’t provide for a definition of these terms). A self-employed individual would not participate in the ORPP. Need help deciphering your options? We can help. We are in the process of actively reviewing the proposed legislation as it unfolds. As always, The Winch Group offers resources and expertise to provide advice and guidance to our clients in light of this new legislation. In each circumstance, we’ll make sure to service your best interests first. Contact your Winch Group Benefit Advisor for more information or to discuss your options. – Don’t offer alcohol at all. Organizations are encouraged to become familiar with the details of these new Leaves of Absences that accompany seven other unpaid leaves existing under the Employment Standards Act, 2000 (Ontario). On June 1, 2014, the new general minimum wage changed for most workers in Ontario to $11.00/hour. This also affects employees who earn some or all of their pay based on commissions. In other words, commissions earned must amount to at least the minimum wage for each hour the employee has worked. Based on two recent court decisions, child care obligations are now being seen to fall within the scope of ‘Family Status’ under Human Rights Legislation. This means employers can be accused of discrimination for failing to accommodate reasonable requests from employees who face difficult child care arrangements for their young children. Employers are encouraged to seriously consider and assess all reasonable requests for accommodating these parents to the point of undue hardship. Read a recent article entitled, “Employers can’t punish parents over child care needs, says court” published in TheSpec.com. NCHR will be following any new developments closely. It is important that the correct group insurance termination date is applied when an employee’s employment terminates. Under a standard Insurers contract, an employee’s group insurance coverage ends on the date the employee-employer relationship ends. For an employee actively at work (i.e. not on a leave of absence or laid off), termination usually occurs on the last day worked. For the purpose of administering your insurer’s contract, the term termination pay is used to refer to salary paid in lieu of notice for the statutory notice period. Termination pay also includes vacation pay, salary and/or overtime pay owed to the employee at the time of termination. If a terminated employee receives termination pay, his or her benefit coverage still ends on the last day worked, unless the employee works in Ontario or the Northwest Territories. In these jurisdictions, benefit coverage ends on the last day of the statutory notice period that would have been required if salary had not been given in lieu of notice. For example, an employee working in Ontario or the Northwest Territories who has one year of service is entitled to two weeks of statutory notice of termination. If salary is paid in lieu of notice, coverage continues until the end of the two-week period. In all other jurisdictions, coverage ends on the last day worked. Severance agreements differ from employment contracts. Once the employee-employer relationship ends, the insured no longer meets the definition of an insurable employee, and is no longer covered by the group insurance contract. There may be situations in which a plan sponsor wishes to extend coverage for certain benefits beyond the usual benefit termination date, as part of a severance agreement. Under certain circumstances, all insurers will consider extending coverage for basic life and AD&D (up to $250,000), dependant life, healthcare and dentalcare for a limited period of time, providing the extension applies to all employees in similar circumstances. Short-term disability, long-term disability and elective benefits such as optional life cannot be extended. If you are considering extending benefit coverage as part of a severance agreement, please contact your insurance group representative before offering it to the employee. Your representative can then determine which benefits can be extended and for what length of time, as well as the cost involved. Additional information about termination of coverage, extending coverage under a severance agreement and ‘Statutory Notice Periods by Province’ are available. Please contact your Benefit Advisor at The Winch Group for this information. This information was organized by Great-West Life and disseminated through GroupLine. It is intended for informational purposes only. It is not intended to be legal or tax advice. Please consult with your professional advisors about your particular circumstances. The content of this GroupLine is for general use and informational purposes only. It is not intended to be legal or tax advice. The content of this GroupLine is based on information available at the time of publication, which is subject to change. Efforts have been made to ensure the accuracy of the information contained in this GroupLine. However, it may contain errors or omissions or become out of date following publication. You may wish to consult your professional advisor(s) about your particular circumstances. New Occupational Health and Safety Act legislation requires mandatory health and safety awareness training for every worker and supervisor. This new legislation comes into effect on July 1, 2014 and will apply to most organizations in Ontario. To ensure your organization can meet these new requirements by the deadline, utilize the free tools and training programs provided in the following article: www.labour.gov.on.ca/english/hs/training/. The Winch Group has partnered with Neil Curtis HR Consulting & Recruitment Services (NCHR) to provide a full suite of human resource support to the Winch Group’s entire client base at a reduced rate. To stay connected, we have created a quarterly NCHR enewsletter that will contain important information about HR related legislative updates and other best practice suggestions to help you better manage your business and employee situations. A helpful reminder to all Winch Group clients regarding our unique prescription drug arrangements. Please review the following instructions below when visiting different participating pharmacies. 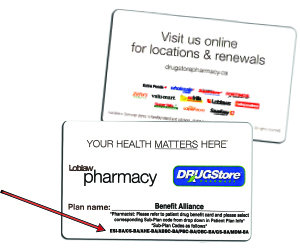 At any Loblaw or DRUGStore pharmacy, present your Benefit Alliance Card along with your employee drug card (the Loblaw card does not replace your drug card but must accompany it). The Pharmacist must enter the Sub-Plan Codes located on the front of the card at the bottom. Metro and Food Basics* pharmacies are aware of your preferred arrangement and discounts so there is no separate Benefit Alliance card needed to present to the Pharmacist. Simply present your employee drug card. *Exception: Association Plan members are required to present a separate identification card at Metro/Food Basics locations. If you have any other questions or concerns regarding these transactions, please speak with your plan administrator for more information. The Winch Group Inc. has partnered with Neil Curtis HR Consulting & Recruitment Services (NCHR) to provide a full suite of human resources support to the Winch Group’s entire client base at a reduced rate. Increase profitability by empowering employees to better understand the goals of the business NCHR can be your organization’s trusted HR advisor and provide tactical or strategic support for all your employee related matters. NCHR offers competitive rates and different plans that suit any business structure.